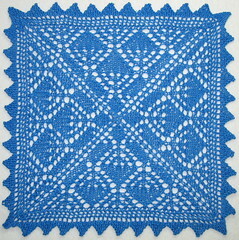 Here is another free washcloth pattern I put together. 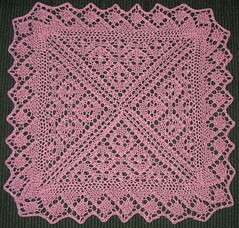 It's done in the size 3 crochet cotton. 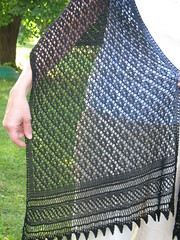 This one is 53 sts on size 3 needles. I'm loving the green grass, warmer temps and the smell of the neighbor's lilacs coming in through the open windows. I wish lilac season was longer. 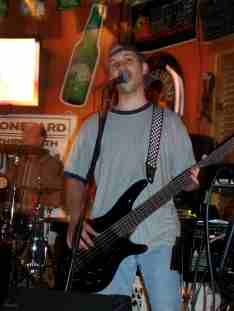 Edit on 4/12/12: Click this link for help with the SSK. Thanks again for the book recommendation. I picked it up over the weekend and started reading, and drinking water, and giving it to the kids. I'm looking forward to reading more when the kids go to bed tonight. If you're willing, could you email me, mniedz at earthlink dot net? I'm a mix of hopeful skepticism right now. Ah, I see my husband is logged in right now, so this will come up as a strange name, but it is me -- Marie N. from Homestead L. A. Thank you for posting that very well-written and pretty lace cloth pattern, and double thanks for charting it and putting it into pdf format. It looks very professional, and the extra work and time you took is greatly appreciated! I just started this cloth and believe there's a typo in the number of stitches to cast on, which should be 53, not 58. 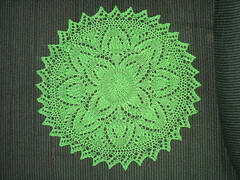 Four repeats of 11, plus 1 = 45, plus the 8 sts for the border = 53. Again, thanks for a very nice-looking pattern. Thank you,Karen, for both of your comments. You are correct about the cast on. It should be 53 sts. I'll make the correction to the pattern. Sorry about that! And here I thought I was proof reading it so close! 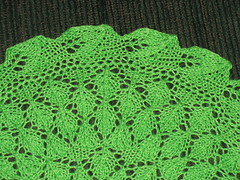 Love your leafy vines pattern and would like to make it but I do not quite understand how to do the "knit those two stiches together through the back loop" the SSK. Can you please help me? Carol, I added a link the original post to show you how to do the SSK.